A team of researchers, including a photosynthesis expert from ASU, has found evidence of photosynthesis taking place deep within the Pacific Ocean. The team found a bacterium that is the first photosynthetic organism that doesn’t live off sunlight but from the dim light coming from hydrothermal vents nearly 2,400 meters (7,875 feet) deep in the ocean. The discovery of the green sulfur bacteria living near hydrothermal vents off the coast of Mexico has significant implications for the resiliency of life on Earth – and possibly on other planets, says Robert Blankenship, a member of the research team and professor and chair of ASU’s chemistry and biochemistry department. “Life finds a way,” Blankenship says of the plucky bacteria that were found in a vent field called 9 North off the coast of Mexico. The bacteria apparently live in the razor-thin interface between the extremely hot water (350 degrees Celsius, or 662 degrees Fahrenheit) coming from a flange vent and the very cold water (2 degrees Celsius, or about 36 degrees Fahrenheit) surrounding it. Researchers have found a bacterium that is the first photosynthetic organism that doesn’t live off sunlight but from the dim light coming from hydrothermal vents deep within the ocean. The research team is led by J. Thomas Beatty of the University of British Columbia, located in Vancouver, British Columbia. They published their discovery in an article titled “An obligately photosynthetic bacterial anaerobe from a deep sea hydrothermal vent,” in the June 20 issue of the Proceedings of the National Academy of Sciences. In addition to Blankenship and Beatty, team members are Jörg Overmann and Ann Manske, University of Munich, Germany; Michael Lince, ASU; Andrew Lang, University of British Columbia and University of Alaska, Fairbanks; Cindy Van Dover, College of William & Mary, Williamsburg, Va.; Tracey Martinson, University of Alaska, Fairbanks; and F. Gerald Plumley, University of Alaska, Fairbanks and the Bermuda Biological Station for Research, St. George’s, Bermuda. 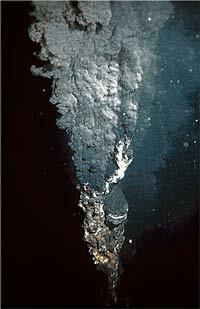 The team collected water samples around the hydrothermal vents of 9 North and surrounding areas. From the samples near the vents, they cultivated a microbe that grew in response to illumination near the thermal vents. By using DNA analysis, the team classified the microbe as a member of the green sulfur bacteria family, which use light and sulfur to obtain energy. The fact that the organism is obligate means it solely relies on photosynthesis to live. “This is startling in the sense that you do not expect to find photosynthesis in a region of the world that is so completely dark,” Blankenship says. Sunlight can penetrate 100 meters to 200 meters (about 330 feet to 660 feet) into the ocean, slowly dimming as the depth increases. Because these organisms live nearly 2,400 meters below the surface – almost 1.5 miles down – the team believes they must be getting light from the hydrothermal vent near where they were found. Blankenship says the antenna system of the bacteria uses a chlorosome complex, which basically acts like a microscopic satellite dish, to efficiently collect any light it can and transfer it to the organism’s reaction center. The reaction center is where the photosynthesis takes place. Blankenship says this discovery is important on two different levels. One is what it means to life on Earth; the other is what it means about where to look for life forms on other planets. For example, Europa, a planet-sized satellite of Jupiter, long has been thought to have some of the necessary attributes to harbor life. But it is far too distant from the Sun for traditional forms of photosynthesis. It is believed that under the ice-covered surface of Europa are liquid oceans – and at the bottom of those oceans it is speculated there might be very hot thermal vents. Those vents could harbor the potential for spawning photosynthetic organisms. By Skip Derra. Derra, with Marketing & Strategic Communications, can be reached at (480) 965-4823 or (skip.derra@asu.edu).